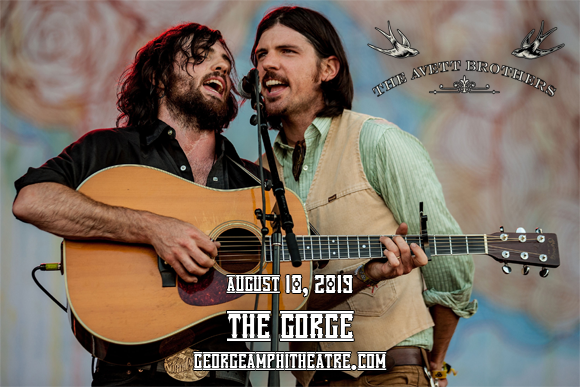 On their highly anticipated new tour, folk superstars The Avett Brothers will be performing at Gorge Amphitheatre on Saturday 10th August 2019! Having released two new tracks towards the end of 2018 – “Trouble Letting Go” and “Roses and Sacrifice” – there are rumors that a brand new album is waiting in the wings, which would be their first since 2016's True Sadness! So get ready to dance to some brand new material, as well as classic Avett Brothers fan favorites, as this hoedown gets going! The Avett Brothers is an American folk rock band that was formed in 2000 in Concord, South Carolina by brothers Scott and Seth Avett, and their friend Joe Kwon, as an acoustic side project to their existing band, Nemo. After Nemo disbanded, the acoustic group continued to record and perform together, and in 2001 bassist Bob Crawford joined the band. Country Was, their first full-length album, was released the same year, leading to a deal with Ramseur Records in 2003. After the release of several albums that honed the band's sound and songwriting craft, the group caught the attention of world-famous producer Rick Rubin with their fifth studio album, Emotionalism, which debuted at the top of the Billboard Top Heatseekers Albums chart. The Avett Brothers were signed to Rubin's American Recordings label and in 2009 they released I and Love and You – their first album on the label. The record peaked at number 16 on the Billboard 200 best-selling albums chart, number 8 on the best-selling digital albums chart, number 7 on the rock albums chart, and number 1 on the folk albums chart, serving as their breakthough into the mainstream. The band has released two more top five albums on the Billboard 200 since then, and they have received three Grammy Award nominations.